Official Lineage OS 15.1 based on Android 8.1 Oreo now available for Moto Z2 Force. It has been just over a year since Cyanogen Inc. shut, The team has now officially announced the LineageOS 15.1 update with an Android Oreo 8.1 base, and made it available to a select number of Smartphones. Moto Z2 Force Android smartphone was launched in July 2017. The phone comes with a 5.50-inch HD display with a screen resolution of 1440×2560 pixels. Moto Z2 Force is a single SIM (GSM) Android smartphone that accepts a Nano-SIM. Connectivity options include Wi-Fi, GPS, Bluetooth, NFC, USB OTG, 3G, and 4G. Moto Z2 Force is powered by 2.35GHz octa-core Qualcomm Snapdragon 835 processor with 4GB of RAM & 64GB of internal storage that can be expanded up to 200GB via a microSD card. As far as the cameras are concerned, the Moto Z2 Force packs a 12-megapixel primary camera on the rear and a 5-megapixel front-facing camera. Lineage OS Android distribution is a free and open source operating system for smartphones and tablet computers based on the Android mobile platform. Lineage OS 15.1 (Android 8.1 Oreo) is developed by numerous device-specific maintainers and uses Gerrit for its code review process. Lineage OS 15.1 is based on the Android 8.1 Oreo, which is the Google’s latest mobile operating system and is the safest and fastest version of Android. The lineage OS 15.1 is much better and has some unique features. The most widely-installed Android custom ROM now offers all the features for hosting Android 8.0 and Android 8.1 Oreo. This means support for service limits and snooze, photo-in-picture mode, autofill framework, better background apps and better memory performance/battery, smart text selection and more for notification channels. As far as the new features go, you can now set the custom accent color, and change between a light and dark mode. Apart from this, it has strong security and speed improvements that keep your smartphone safe and operate fast. With the introduction of Lineage OS 15.1, there is another major announcement in the team that they are formally launching the charter of device support requirements, a document that outlines all the requirements that the lineage and its maintenance are created is called Should be considered “official”. If you own the Moto Z2 Force, then you can install the latest Lineage OS 15.1 on your smartphone. You need to install your own Google Applications package (Gapps). you can follow simple steps to Install Lineage os 15.1 on your smartphone. To flash LineageOS 15.1 based on Android 8.1 Oreo, you need to unlock bootloader and flash TWRP recovery on Moto Z2 Force. Please consider supporting the developers who work on this project in whatever way you can. You can show them support by following them on all of their official social media Facebook , Google+,Twitter . Installing Lineage OS 15.1 [Android 8.1 Oreo] ROM on your Moto Z2 Force requires the bootloader to be unlocked & Custom Recovery Installed, which may VOID your warranty and may delete all your data. Before proceeding further you may consider backup all data on the phone. You are the only person doing changes to your device and kbloghub.com cannot be held responsible for the mistakes done by you. 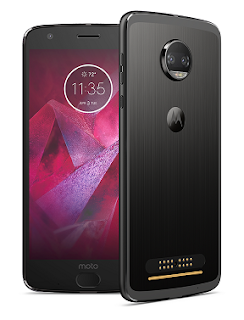 This new Lineage os 15.1 [Android 8.1] Official Rom has to be installed on the Moto Z2 Force model only; if tried on other devices, it might get bricked [To check your device model: Go to Settings >> About phone >> model number]. Make sure to Backup your phone before doing this step using TWRP or CWM or any Custom Recovery. Make sure the device has more than 60 – 70 % battery. You need to Unlock its Bootloader & Install TWRP Recovery on Moto Z2 Force. They don’t come to pre-installed Gapps on LineageOS 15.1 builds. If your device is running on Official Lineage OS 14.1 build, then you can follow these steps without wiping your data. Download the Lineage os 15.1 for Moto Z2 Force from above download link or through the built-in updater app. If you download it from the updater app, you’ll need to use the “export” option in the menu to save the build to your internal storage. Note:- If face any boot loop issue, navigate back to TWRP settings, and select ‘Wipe cache/dalvik‘. This procedure will help resolve any issue with regard to custom ROM installation. That’s it! Your device should now have Official Lineage OS 15.1 ROM installed ! Go to Settings > About phone to verify. Let us know how’s your experience with Lineage OS 15.1 update for Moto Z2 Force by comments below.